This exciting release brings a dynamic gaming experience with extra Wilds, Wild reels and free spins. The Sweden-based developer of online gaming content Play’n GO has announced the launch of its latest addition to the company’s line-up of slot games. 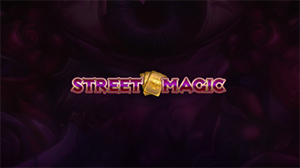 Titled Street Magic, this exciting new release brings a dynamic gaming experience where players will benefit from extra Wilds, Wild reels and free spins. Street magic has 5 reels, 4 rows and a total of 20 fixed paylines, while the game’s betting options are pretty wide, ranging from a mere $0.20 up to $100. However, you should be careful when choosing your bet, since the slot’s high variance could quickly you leave empty-handed. An average return to player is at 96.48%. The symbol featuring the magician serves as both Wild and Scatter and can land only on reels 1, 3, and 5. When acting as Wild, this symbol will replace other game icons, helping players create additional winning combinations, while as Scatter, it will trigger the Magician Performance feature whenever a minimum of two of a kind find their place on the reels. The Transporting Man, where the third Scatter is added to the reels, activating the Free Spins feature. The Free Spin round is activated whenever 3 Scatter land on the reels, both during the main game and the Magician Performance feature. Players will pick a card, revealing the number of spins they won, which can be 8, 10 or 12. Any Wild landing on the reels while the feature is active will turn sticky, and will stay in place until the feature comes to an end. The Play’n GO’s Street Magic slot is scheduled to go live on September 13. Once it hits the market, you’ll be able to play it at any online casino powered by the renowned developer.